Brixham Pirates steal first prize! Swashbucklers from Brixham ran ashore in Torquay storming the Riviera Conference Centre to take the booty. All Scally’s were present and incorrect. Pistol shot filled the air but fear not, no-one danced the hempen and none were pillaged. 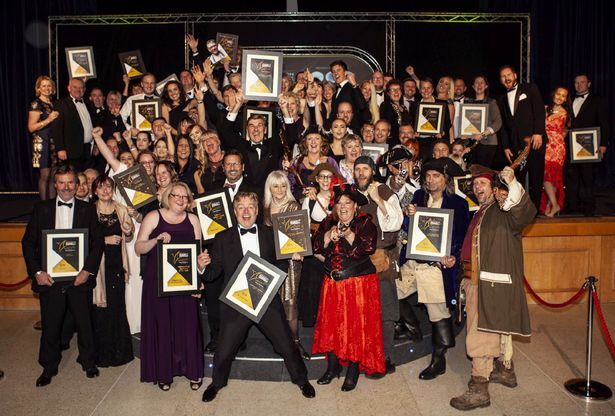 These buccaneers were not scuttling the 2018 South Devon Tourism & Hospitality Awards, they were just celebrating winning the award for best Tourism Event/Festival of the year – looks like some may have been 3 sheets to the wind, me hearties. The Brixham Pirate Festival was a huge success and will take place again in 2019 on 4-6 May. Even without the Festval, Brixham is one of our favourite days out whilst staying at our Dartmoor Holiday Cottage. You can find out more about Brixham and other seaside towns to visit whilst holidaying at Three Pound Cottage by looking at our Coastal Towns page in our Things to Do section.